this item is custom made just for you, and your skins' needs. 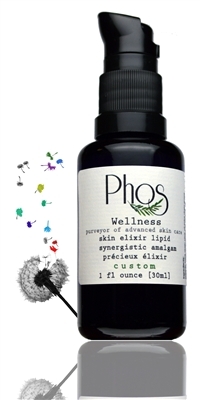 at phos wellness, we understand that every person’s skin and daily activity is different. no one is alike. we introduce custom made elixirs and target your personal skins need. > under-eye circles? puffiness? dry skin? patchy? breaking out? rosacea? cellulite? eczema? other? * custom made for your needs. * targeting your skins issues. * day or night formula. * luxurious, lightweight or heavy. you guide and we will select what is right for you. * we select a base carriers which suits skins needs working toward improving skins overall condition. * marula nut oil provides emolliency and give skin a smoother, glowing healthier appearance. * uniquely created for you. in order to take advantage of this unique service, we would like to further understand your skin profile; via 10 very simple questions. email us your 'order number' along with the answers to the questions below. using a yes or no answers. using a sliding scale of 1 - 5 where applicable. * do you like a light feeling elixir on the skin? * do you like a heavy feeling elixir on the skin? * do you have a oily t-zone? * do you have oily cheeks? * do you have an oily chin? * after you wash your face and before toning or moisturizing, is your skin tight? example "my cheeks are tight if i don't moisturize"
* do you break out [pimples] easily? * if yes, where on the face? * is your skin sensitive? - sensitivity refers to skin that easily reacts to a variety of change in temperature, causing skin to become red/blotchy, ie. if by simply placing a finger to your face, a break out or red patch shall occur. * do you have rosacea, eczema or another skin condition? do you have additional questions? please ask. phos is dedicated to the best skin care and the finest customer service. feel free to ask questions. we shall return your email promptly. your custom made order shall be made and shipped quickly and with ease. you shall receive your product within 3 - 7 days. If necessary, additional elixir may be added. make sure to blot off excess.